Heather Menzies is an award-winning magazine and book writer. 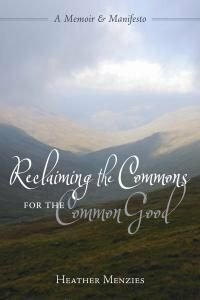 She has just completed her 10th book, Reclaiming the Commons for the Common Good. Her last two books were on the Globe and Mail’s “Best 100” book list. This entry was posted in About Heather, Author and tagged award, commons, manifesto, memoir, merilyn simonds, Ottawa, reclaiming commons, Richard Clippingdale, Suzanne Evans. Bookmark the permalink. This is a struggle between two realities: the local, lived one so rich in inter-dependencies and shared history, and the more remote, abstract one in corporate budgets and government policy positions. Read more of my article on the Paddle for the Peace in the Watershed Sentinel.